When the chance to have a cultural experience comes along, I always take it. So when I heard about the Wadi Zalaga camel race, there was no doubt in my mind that I had to go. This Bedouin camel race, held high up in the desert of the Sinai peninsula, Egypt, was a competition between the Tarabine and Mzeina tribe. 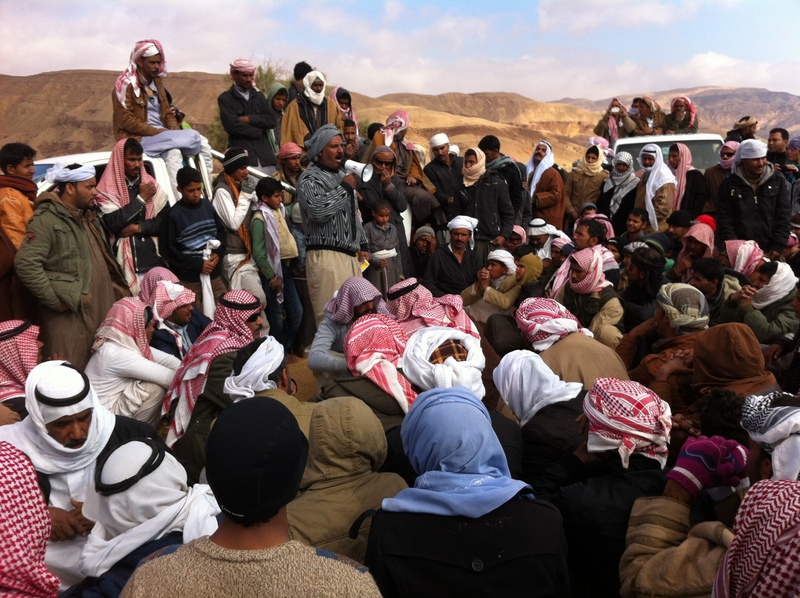 If the Bedouin were involved, there promised to be mayhem (and I mean that in a good way), excitement and disorganization (or rather – nobody really knowing what the hell is going on). Most important events around here are quite spontaneously organized. I went to a wedding once in the desert – nobody even knew if there was going to be a party or not that night! You just have to wait and see. Most of all, the camel race promised to be fun…it would entail a long drive through the mountains to get there, a night sleeping out under a starry Arabian sky, a lot of excited Arabs shooting guns, and a mad camel-dash one way down a wide stretch of desert between the mountains. Sign me up! Getting organized to go in someone’s car a couple of weeks before the race was the first obstacle and the usual “Bedouin” dilemma. You can’t organize anything in advance here because everything is “inshallah” – Gods will. Organizing anything in advance is just tempting fate to get in the way and stop us going – the car might get stolen, the driver might get ill, I might get hit by a bus – the odds of something happening are just too great, so rather than take the risk of being organized too far ahead of time and it all going to custard, we wait til the last minute. And, like a wish from Aladdin’s lamp, everything miraculously falls into place. It is all illogically logical…the trick is never to ask what the plan is or what’s going on. Because nobody really knows. Things just unfold here. You’ll just get some half-baked, unsatisfactory answer anyway. It’s best just to enjoy the suspense. So here I was, the day before the race, crammed into a Toyota pick-up with three Bedouin men, Mohamed, Sarukh and Sallah, and a Russian tourist with an unpronounceable name. The drive out into the desert was more of a safari over rocks and sand through the stunning, rocky mountains. It was also wintertime, January, and the day was bitterly cold in the desert. I was freezing, but also glad not to be one of them, dressed in a thin white cotton robe and a jacket. 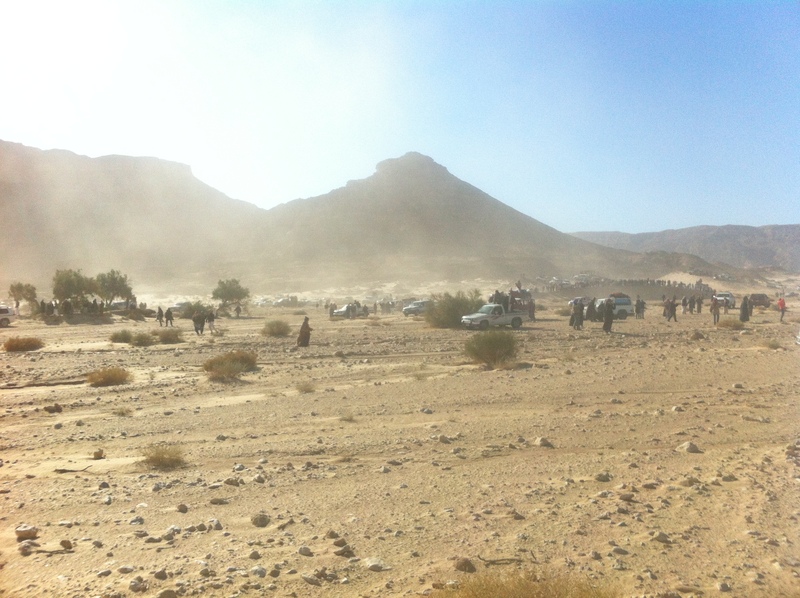 Finally, late afternoon, we reached Wadi Zalaga, the sandy valley where the race was to take place the following day. Vehicles were scattered in their various camps in all corners of the desert. We set up camp Bedouin style: a few rugs were tossed on the ground to sit on, a few blankets to sleep under, a fire was lit, dinner was made (hummus, beans and bread), and we drank endless cups of tea, trying to keep warm wrapped in thick, fluffy blankets. The wind whipped round us and, for a bit of evening time “Wild East” atmosphere Bedouin men fired gun shots into the air. The night was stupendously cold – I had so many clothes on and blankets over me I couldn’t turn over without potentially suffocating myself. A few flakes of snow even fell. The next morning we drank tea to warm up and around 8am cars slowly crawled from their camps towards the “start line”. This is a loose term as it is not like there was any kind of line. I could see around 10 camels bunched at the “start”, and there were more behind us still making their way. Around 300 cars swerved and slid across the sand towards the race – incredible sight just to see so many vehicles. Suddenly the camels up front bolted. Hang on! There was no start gun, it wasn’t 10am, what the heck was going on (oops, don’t ask that). Not all the camels had even reached the start! Chaos already, I love it. It was all going to “no plan”. Mayhem broke loose now: as soon as the camels were off, all the vehicles put their foot on the gas and took off after them. Within minutes we were rally-driving in a mad camel-chase with all the other cars down the desert valley – it was bedlam at its best, with cars swerving to avoid rocks, sand holes and each other. Every now and then a car got stuck or broke down, the passengers would leap out and run like madmen and jump aboard other cars. It had been an exciting race. Not so much the camels, but the madness and mayhem. 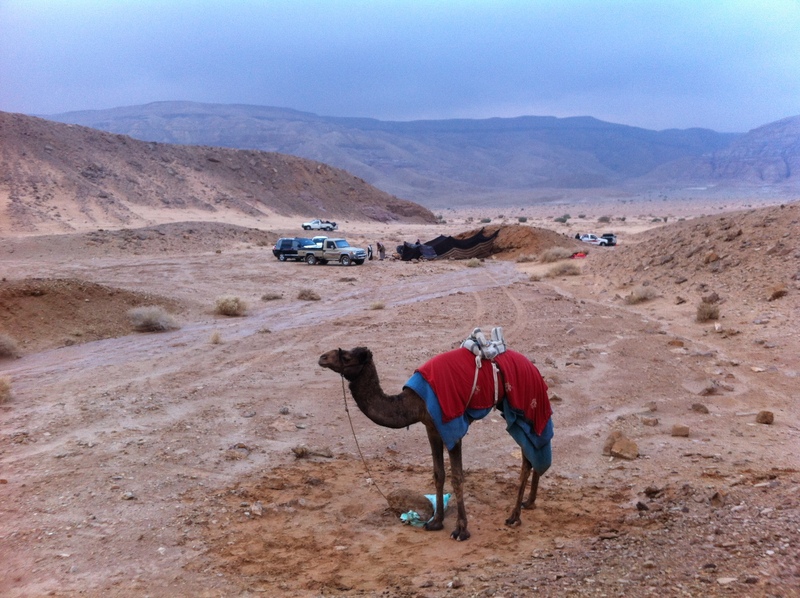 A week later, back in the seaside town of Dahab, I was talking with some Bedouins about the camel race. They informed me there was to be another camel race, inshallah, as the first one had been declared invalid. Apparently there had been a dispute about which tree represented the finish line and the Tarabine thought they had crossed the line first. Not to mention not all camels being at the start line, and there being no start gun and – well, I won’t go on…Bedouin chaos. Love it. Might see if I can get a ride in someone’s car – the day before of course.